Celebrating Basildon New Town was the theme of a Civic celebration in St Martin’s Church (31 January) to commemorate 70 years since the new town was created. After a multifaith blessing, speakers from Leonardo, Eastgate Centre, Vange Primary School, Woodlands School, Sport for Confidence, Basildon Heritage and the Rt Hon Baroness Smith of Basildon shared their history and stories of the New Town. Throughout the evening, Performing Arts Teacher from Woodlands School, Martin Townsend, played the role of Lewis Silkin MP performing the 1940s speech about his hopes and ambitions for what Basildon New Town would be. 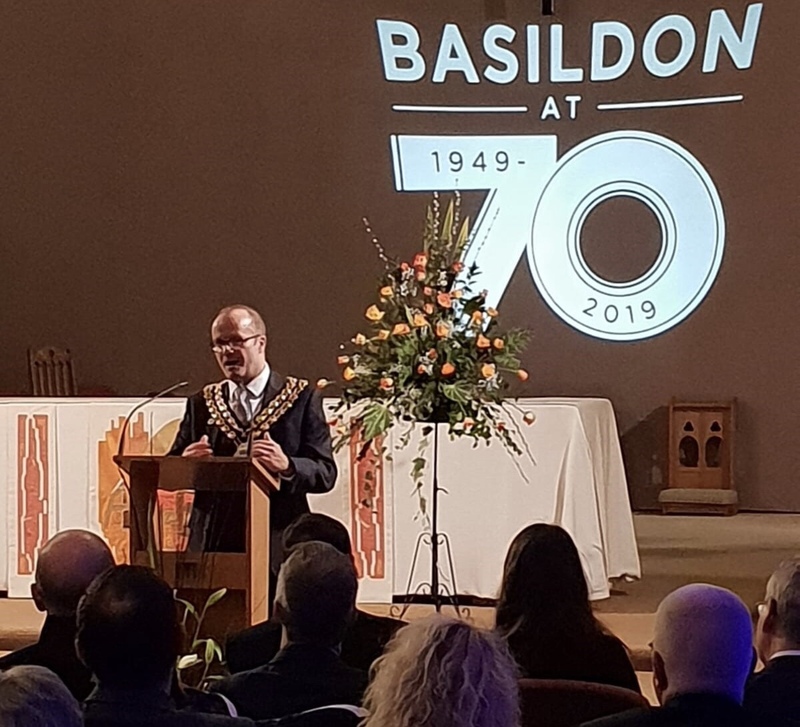 Mayor of Basildon, Cllr David Dadds JP, said: “During this 70th year, our aim is to bring our communities together to celebrate what we have achieved and remember those who have succeeded in Basildon and contributed to its success. At this celebration we started telling that story and heard stories of success, ambition and heart. “It is a great honour to be the Mayor of Basildon in any year – but it is particularly special to be Mayor on this 70th year, with the opportunity to meet lots of people who volunteer and make a real difference to the residents and community of Basildon New Town”. Councillor Kevin Blake, Deputy Leader of Basildon Council and Chairman of the Leisure, Culture and Environment Committee, added: “Basildon and proud was the overriding theme of the evening and I would like to thank all the speakers who shared their experiences of working and living in Basildon with such passion. “We’re committed to working together with our community to make Basildon’s 70th birthday an occasion to remember, with celebrations taking place throughout this very special year”.